The FPGA-/µ-controller- based CAN bus data loggers of the UniCAN 2 family have features that are otherwise - if at all - only found in - PC-based devices. At the same time they offer unique data security. Fail-safe data recording: Neither in the event of a supply voltage outage, nor in the event of the removal of the memory card during operation, will the hitherto recorded data be lost. The CSM REC09 file system remains consistent and recording can be continued without difficulty. Simultaneous recording of CAN-Trace and of signals in respectively up to eight groups with own trigger and filter conditions. Optimized memory access on CF cards: With the increasing segmentation of the memory card, the write access on the card in the case of data loggers with conventional file systems will increasingly slow down. Not in the case of UniCAN 2. Pre-trigger on CF-Card, enables Gigabyte large Pre-trigger. Remote data transmission over UMTS / GPRS modem simultaneously possible with the data collection. 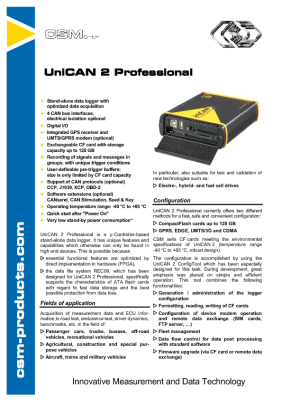 UniCAN 2 Professional Tools: Easy to use, thereby high-performance configuration software package incl. configuration, data postprocessing and data transfer; ideal for fleet management. The UniCAN 2 in a robust die-cast aluminium housing has been designed for use under harsh environmental conditions in road test, endurance test, driver dynamics, benchmarks as well as test and validation of new technologies. 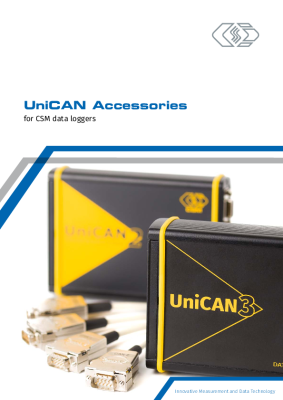 The UniCAN 2 data loggers are offered in different hardware and software-expansion stages. 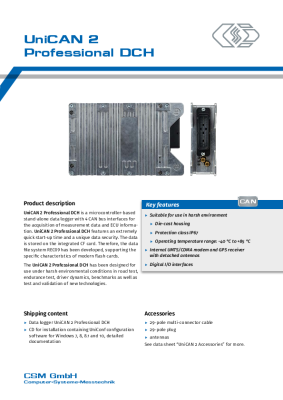 With up to 12 CAN bus interfaces, freely configurable digital inputs and outputs, Wake-on-CAN, LAN, WLAN - When developing the UniCAN 3 data logger, numerous requirements from state-of-the-art vehicle development were taken into account. 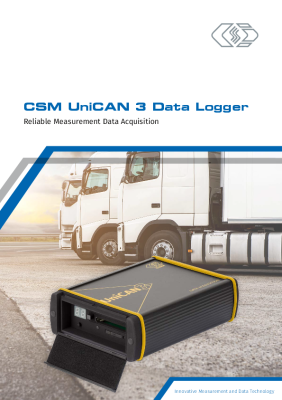 CSMuniconf is the comprehensive software package for the configuration and management of the UniCAN 2 and 3 data loggers.